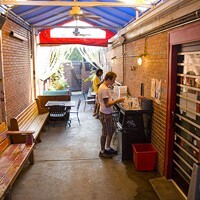 Everybody knows your name (Drunkie) at this chill, no-frills Plaza Midwood neighborhood hangout. Hey, its good enough for Bill Clinton, who stopped in for lunch before a speaking engagement at the VFW. And lets not forget the dog-friendly deck, killer jukebox and ping pong tables with stadium seating. Did I mention that Clinton ate there? 1228 Thomas Ave. 704-376-1622.